"I got this from my mother. It's as English as you can get. Decorate with whipped cream and flaked chocolate." 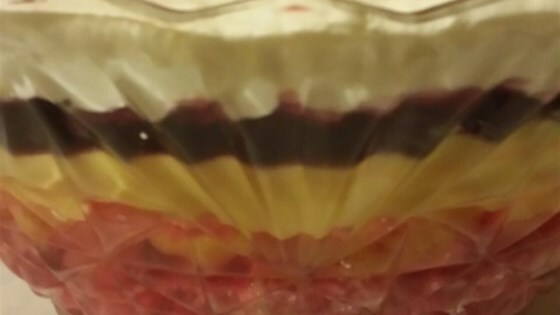 Place the cake in a glass serving bowl and cover with the canned fruit. Prepare gelatin according to package instructions and pour over fruit and cake. Combine custard powder and sugar in a small saucepan over medium heat. Stir in milk and cook until thick and creamy. Pour over sponge cake mixture. Chill until set.